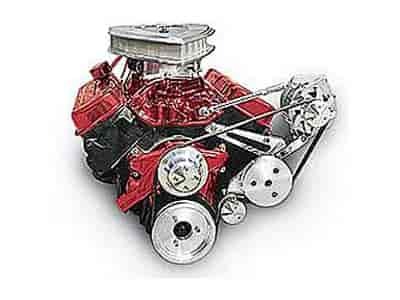 The March Big Block Chevy Deluxe Serpentine Conversion kits replace your low performance V-belts, pulleys and brackets while retaining your standard rotation water pump. They are simple to install and eliminate belt throwing. Kits are available with performance pulleys for increase horsepower (approx. 12 h.p.) or high water flow ratios for increased cooling. They are CNC machined from solid billet 6061-T6 aluminum and feature a "No Polishing" maintenance-free clear powder coating! Gates K060586 - Micro v belts 59 1/4"